Many elements of critique are involved in building public pools and spas. 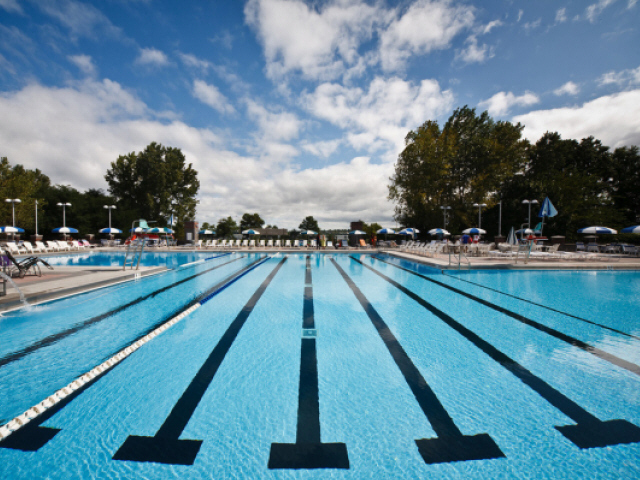 The pumping and filtration system of a commercial / public swimming pool and or spa must follow Environmental Health Department regulations and guidelines. 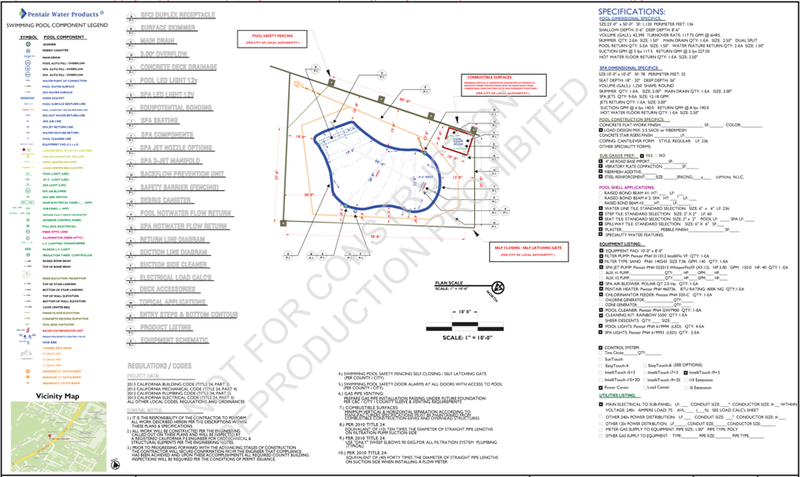 The Enclosures, Signage, ADA Handicap Guidelines and many other design elements must exhibit a smooth pathway for achieving compliance in order to affirm a well thought-out plan for action. 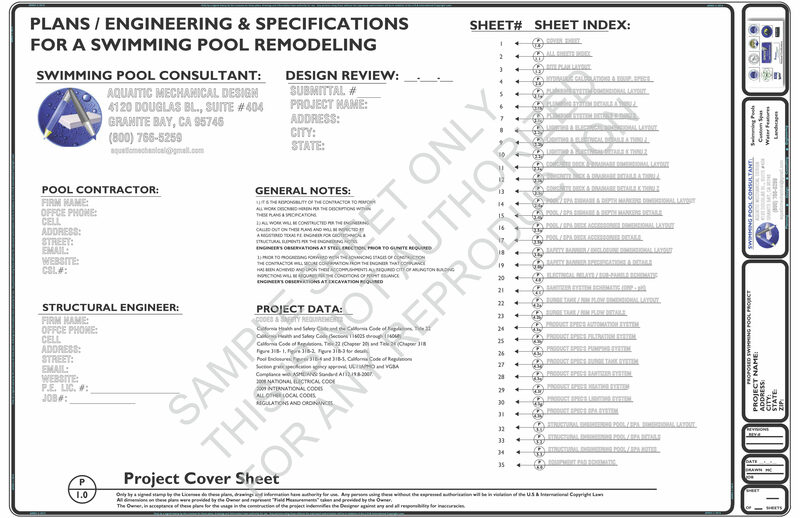 By viewing the image below you can gain greater insight for some of the prerequisites that are necessary in producing a set of compliant commercial swimming pool plans and specifications. In addition to accomplishing a well planned direction, plans must be able to be systematically executed in an efficient sequential production performance. A key element of success is producing “build-able plans” that can be effectively interpreted by skilled craftsmen and knowledgeable tradespeople. Understanding the assemblies and corresponding operational functionality is a critical component for arriving at the planned destination, a successful completion! Our turnkey commercial designs provide our clients a higher level of accountability with regards to designing and building a project within the budget. One reason for this key difference is that we have also built what we’ve designed for generations! In doing so we can commit to creating a design that has a real construction budget without surprises along the way…We are a designer that thinks like a contractor and can explain things in the terms our understanding that affords performers a complete picture for the responsibility of the construction assemblies. Few performers have our accredited credentials and in-house capability for providing a complete design / build-able package. In some cases building architects and engineering firms involved with commercial work require specialized knowledgeable expertise in the area of swimming pools, spas, water fountains, ponds, water parks, and other specialized water features. We provide sub-consulting services in such cases whereas the prime consultant needs to add the weight of a higher level of specialized competence to their repertoire. We offer collaborative participation in interfacing civil site works with a strong and well defined plan and specification that will allow 1st Class results to unfold. We’ve been designing, building, servicing, maintaining, repairing and operating commercial swimming pools and water features worldwide for three generations and we truly understand how to project the most complete turnkey project possible on paper and in the dirt! 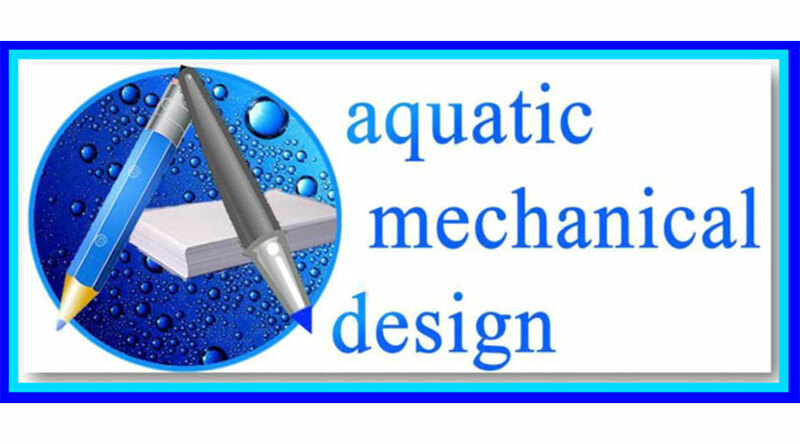 If you are soliciting designing firms for your commercial / public swimming pool and or spa, please take a few minutes and complete the webform below and submit your information, we would enjoy discussing your requirements. Provide the following information: • Spa pool capacity in gallons • Square footage of spa pool water surface area (shall not exceed 250 square feet). • Finish color of spa pool must be white or a light pastel color. Colors other than white must be approved by this Division. If not white, submit color sample(s). • Finish material of spa pool (e.g., white plaster) • Type of spa pool piping proposed (copper, PVC schedule 40 or 80, etc.). • Approved source of water for spa pool(s), restrooms, showers, and hose bibs. • Approved sanitary sewage disposal system for spa pool filter waste water disposal and for sewage from restrooms and showers. 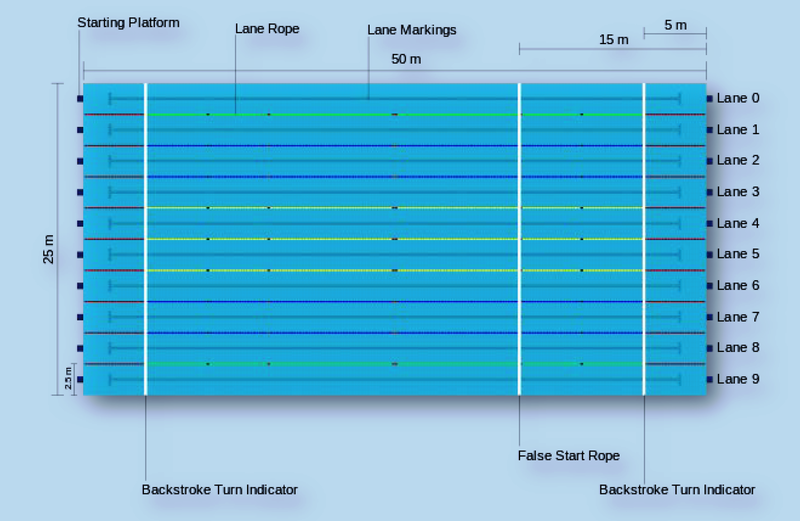 Water Temperature: • The maximum allowable spa pool water temperature is 104ºF. Pool stairs, hand rails, ladders, grab rails and recessed steps: • Submit complete pool stair plans. Include scale cross-section and top view. • Pool stair step treads shall be a minimum of 12 inches in width and shall be uniform in size, except that if the top step is curved convexly, the top step tread shall be not less than 18-inches wide as measured at the point of maximum curvature. • Step risers shall not exceed 12-inches in height. • Step risers shall be uniform in size. • Hand rails shall extend from the deck to not less than a point above the top of the lowest pool step. • The upper surface of hand rails shall be not less than 28-inches above the deck and poolside edge of the handhold. Grab rails shall be provided above both sides of recessed steps and shall extend over the coping or edge of the deck. Recessed steps shall have a minimum tread of 5-inches, width of 14-inches, and shall be designed to be readily cleaned. • Ladders shall be corrosion-resistant and shall be equipped with slip-resistant tread surfaces. Ladders shall be rigidly installed and shall provide a clearance of not less than 3-inches and no more than 5-inches between any part of the ladder and the pool wall. Number of restroom and shower fixtures: • For the purpose of determining the number of fixtures required, one pool user shall be considered for every 15 square feet of pool water surface area (total water surface area if there is more than 1 pool). • Showers: One shower per 50 pool users. • Lavatories: One lavatory per 80 pool users. • Toilets: (1) Female: one toilet per 60 females; (2) Male: one toilet plus one urinal per 75 males. Waste Water Disposal: • Filter waste water shall be disposed of to a sanitary sewer (or other approved waste water disposal system if a sanitary sewer is not available). • 1-inch minimum air-gap separation required • Plans must include size, location and slope of any sanitary sewer line that will receive filter waste water. • Submit the size and location of any proposed filter waste water sump. • Waste water disposal systems shall be designed so as to prevent back-up and overflow of waste water while filters are being cleaned. Potable Water Hose Bibb(s): • Indicate location of hose bibb(s). • All areas of pool deck must be within 75 feet of a hose bibb. • Hose bibb(s) shall be located so as not to constitute a safety hazard. • Approved backflow prevention device required for each hose bibb(s). Life ring 17-inch I.D. min. The enclosure shall be designed and constructed so that it cannot be readily climbed by small children. Horizontal and diagonal member designs, which might serve as a ladder for small children, are prohibited. Horizontal members shall be spaced at least 48-inches apart. Any pool enclosure found to be less than 5 feet high will not be accepted. Openings, holes or gaps in the enclosure, doors and/or gates shall not allow the passage of a 4 inch diameter sphere. The bottom of the enclosure shall be within 2-inches of the finished grade (no loose material such as bark). Gates and doors (including building doors) shall be equipped with self-closing and self-latching devices. The self-latching device shall be designed to keep the gate or door securely closed. Gates and doors shall open outward away from the pool. Hand activated door or gate opening hardware shall be located at least 3½ feet above the deck or walkway. Gates and doors shall be capable of being locked during times when the pool is closed. The pool enclosure shall have at least one means of egress without a key for emergency purposes. Unless all gates or doors are so equipped, those grates and/or doors which will allow egress without a key shall be clearly and conspicuously labeled in letters at least 4-inches high “EMERGENCY EXIT”.